The most effective drying technology for hearing instruments of all types. 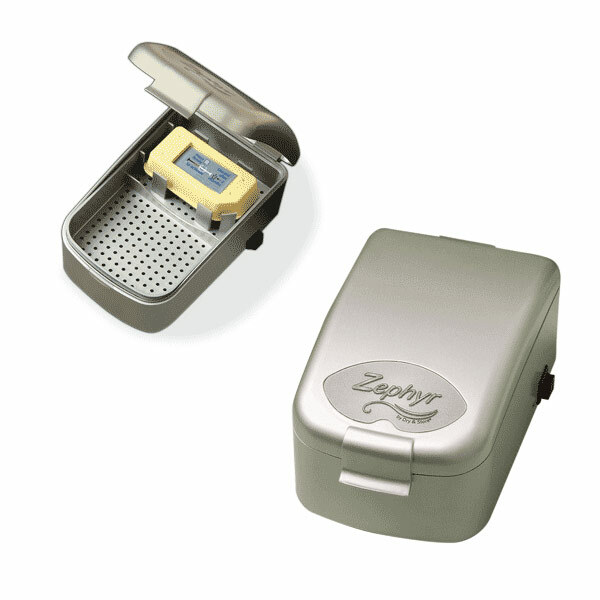 Used daily, Zephyr removes damaging moisture accumulation, dries earwax and removes odors. It can make hearing instruments sound better, and can also extend zinc-air battery life in high humidity locations. Zephyr's small size makes it a great for travel. But it's still big on performance. Like the Global and Professional models, it operates on an 8-hour cycle and utilizes warm, moving air and Dry-Brik II disposable desiccant, proven technology for maximum drying effectiveness. Unlike these other models, Zephyr does not include the germicidal UV lamp. Unit size: 3.6 wide x 5.9 deep x 2.8 high (92 mm x 150 mm x 72 mm). Drying Compartment: (Single tray) 3.2 x 2.6 x 1 (80 mm x 65 mm x 24 mm) Positive-latching hinged lid with a drying compartment that will accommodate all types of hearing instruments, including cochlear implant microphones, headpieces, and speech processors (both ear-level and body-worn). The unit turns off automatically after 8 hours unless the on/off button on the side is pressed. Zephyr power supplies are interchangeable with Dry and Store Global and are CE Marked. They are certified to ETL, UL, and CSA standards and cary GS (Germany), PSE/JET (Japan), C-Tick (Australia / New Zealand), and SABS (South Africa) certifications. Will also work with an inverter for 12V service. Zephyr can be used anywhere in the world - no voltage converter necessary. All that's needed is the appropriate plug adapter, or you can travel adapter-free by ordering individual power supplies with native plugs. Choose from US, UK, Europe, Australia, or South African plugs. Conditioning Cycle: Zephyr has an operating cycle of eight hours. It conditions at an average temperature of 96.8 degrees-104 degrees F (36-40 degrees C) and a relative humidity of 19-25 percent, based on indoor ambient temperatures from 65 to 86 degrees F (18-30 degrees C). Air circulating fan: Ball-bearing fan continuously circulates warm, dry air for the entire operating cycle, causing moisture to move out of the hearing instruments by diffusion. 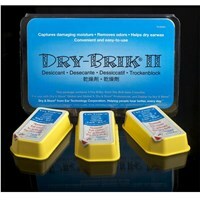 A disposable Dry-Brik, which must be replaced every two months, is included with each Zephyr. This custom desiccant contains an aggressive sorbent (mol sieve), packaged in an attractive, molded, disposable container. Each Dry-Brik has a shelf life of at least one year, unopened. Once the foil label is removed, the Dry-Brik II lasts two (2) months. Replacement desiccants are inexpensive and are available from Dry and Store distributors. The desiccant also absorbs odors as it dries. Batteries do not have to be removed from hearing aids before Zephyr use.